Hospital-associated infections (HAIs) are among the most common complications of hospital-provided care. US healthcare institutions spend nearly $10 billion each year treating HAIs. Researchers at Brigham and Women’s Hospital in Boston found that, on a per-case basis, central line-associated bloodstream infections (CLABSIs) were the most costly HAIs at $45,814. These were followed by ventilator-associated pneumonia infections at $40,144; surgical site infections (SSIs) at $20,785; infections involving Clostridium difficile (C. diff) at $11,285; and catheter-associated urinary tract infections (CAUTIs) at $896. 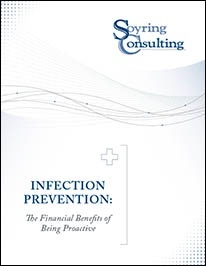 Preventing and controlling infections is a challenge that many hospitals face. While quality improvement initiatives have decreased HAI incidence and costs to date, more efforts are needed. Hospitals are starting to monitor their HAI infection rates, but there are few educational programs in place to ensure awareness among staff about how to prevent infections and what actions to take when they occur. Soyring Consulting provides managerial and operational consulting services to healthcare facilities of all sizes, including For-profit, Not-for-profit, Community, University, and Faith-based facilities and systems. One of our key areas of focus is Quality Assurance & Infection Control. Soyring Consultants are highly experienced in conducting quality assurance reviews in all aspects of the hospital and their effectiveness to sustain facility best practices, as well as ensuring the department or hospital is consistent with administrative rules, licensing standards, and state regulations.